Remember making daisy chains? 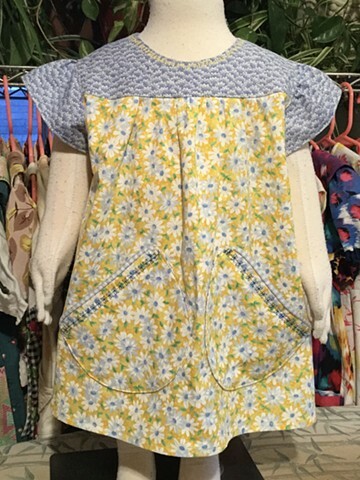 With a yellow and blue theme, Size Toddler (1-2 years), measures 24” across chest, 15” shoulder to hem dress offers generous gathered skirt attached to contrasting print yoke, big pockets with gingham check piping and daisy chain decorative stitching, closes all the way down the back with pale yellow buttons, cap sleeves and yet more daisy chain stitching at neckline. $60, 100% cotton, made by the designer herself and shipped free to any address in the U.S.